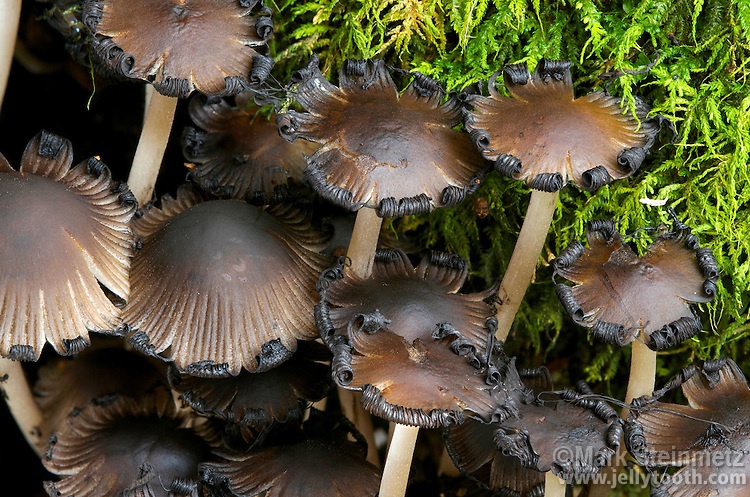 Coprinoid mushrooms, commonly referred to as Inky Caps, digest their own gills in a process known as autolysis. Upon maturation, the gills are liquified into a black, ink-like goo, starting from the margins and slowly progressing upwards. This process allows for the efficient wind dispersal of newly matured spores. Pictured here is Coprinus micaceus (aka Coprinellus micaceus). Common names include Mica Cap and Glistening Coprinus. These mushrooms are usually found in clusters near tree stumps.